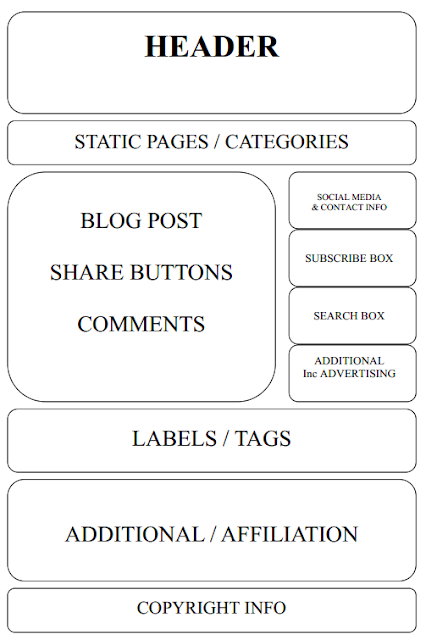 There is an ongoing discussion about the ideal layout for a blog. You may have heard of the F-Shaped Pattern which details the "hot spots" that readers automatically navigate to with their eyes when scanning a web page. Using this theory, the obvious advice is too put your most important information in the hot spots. But does using this placement technique detract from the main feature of your blog - the content? Of course you want your reader to enjoy that blog post that you've put an enormous amount of effort into but it is also useful to have an optimum layout that showcases additional information in the best way. Here I have put together a suggested layout. A header needs to showcase the title of your blog and/or your branding as it is the first thing your reader sees. 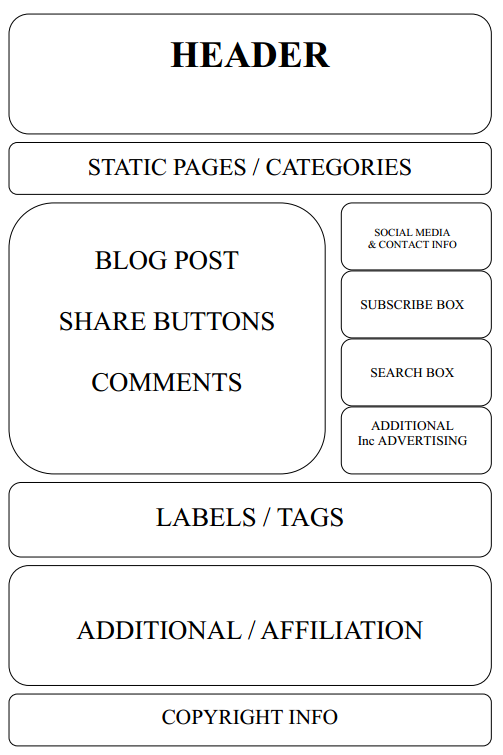 Static pages and categories are next - this is information that rarely changes and helps the reader to navigate your blog. Your content, a way to share the content and the comments should be the main feature of your blog. The sidebar should display contact information, your social media channel links, subscription links (you want the reader to be reminded to return when you post) and the all important search bar which is usually a plug-in or a widget but Google provide a custom search engine that you can easily install in just a couple of minutes. You could also include your archive section here too using a hierarchy display or drop-down menu rather than a flat-list. All other information and affiliations can be installed further down the sidebar or in the footer. Labels and tags are useful so your reader can find related content and whilst displaying a copyright statement isn't a requirement it is a recommendation. Here are some additional hints and tips from established bloggers and brand representatives. What do you like to see on a blog? What makes you switch off immediately?